Merry Christmas! We're closed until 28th-29th December, and re-open on 3rd January. DIRECTIONS FROM HENLEY-ON-THAMES: Leave Henley on the A4130 (Fairmile). Proceed towards and pass through Bix and Nettlebed. Turn left at Nuffield (signposted Nuffield, Stoke Row, Checkendon). Pass through Huntercombe Golf Course and village. Turn right into Timbers Farm, clearly signposted Get Furnished. Please note the return route Nettlebed to Henley is closed we suggest return via Stoke Row and Rotherfield Greys. DIRECTIONS FROM WALLINGFORD: Proceed through Crowmarsh Gifford towards the A4074. Cross over the roundabout and take the 3rd exit towards Henley. Just after the Crown pub take the turning right towards Nuffield (signposted Nuffield, Stoke Row, Checkendon). Pass through Huntercombe Golf Course and village. Turn right into Timbers Farm, clearly signposted Get Furnished. We're lucky enough to be situated in an Area of Outstanding Natural Beauty bordering the Chiltern Hills in South Oxfordshire. 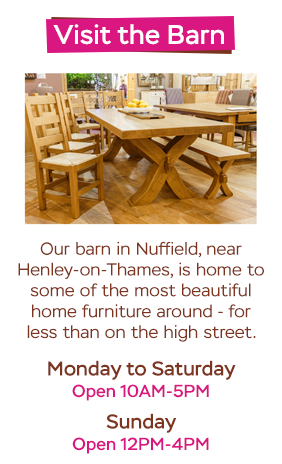 So when you visit our Nuffield showroom, why not make a day of it? Lunch at a country pub, cycle The Ridgeway or walk the River Thames. And don't forget to look out for our resident Red Kites! The Ridgeway, Maharajah's Well in Stoke Row, National Trust Nuffield Place - home of Lord Nuffield, historic Henley-on-Thames with its famous stretch of river, Blue Tin Produce Farm Shop, Paul Clerehugh's renowned Crooked Billet pub and of course the beautiful Oxfordshire countryside.